Carbohydrates are mostly found in grains, legumes, starchy vegetables, fruits, milk, yogurt and sugar. Although lemon is considered a fruit, it is not as sweet as most other fruits because of its lower carbohydrate content. Total carbohydrate corresponds to the sum of sugar, starch and fiber. However, of the three nutrients that comprise total carbohydrate amount, only sugar and starch contribute to elevating blood sugar levels and providing calories. Although fiber does not supply energy to the body, this nutrient is important to prevent constipation. Two tbsp. 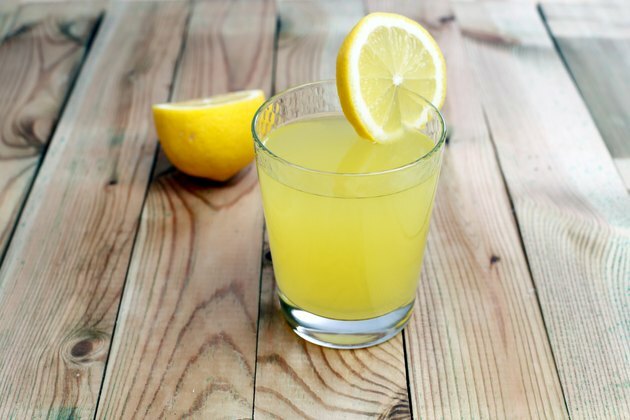 of freshly squeezed or bottled lemon juice provides 2.1 g of carbohydrates and 0.1 g of fiber. A whole lemon usually yields about 3 tbsp. worth of juice. This makes it a very low carbohydrate food choice. You can use a few tbsp. of lemon juice on most low-carb diet plans, although these programs often exclude other fruits. An oz., or about 2 tbsp., of lime juice provides 2.6 g of carbohydrate and 0.1 g of fiber. A whole lime yields approximately 3 tbsp. The same amount of freshly squeezed unsweetened orange juice provides 3.2 g of carbohydrate and 0.1 g of fiber, while a 2 tbsp. of grapefruit juice contains 2.7 g of carbohydrate. Mix lemon and lime juice, both very low in carbohydrate, with a good quality oil to prepare a salad dressing. Add 1 to 2 tbsp. of lemon or lime juice to a bottle of water or drizzle it over a serving of fish. Depending on your daily carbohydrate target, include small amount of orange or grapefruit juice in a vinaigrette or to flavor your water.